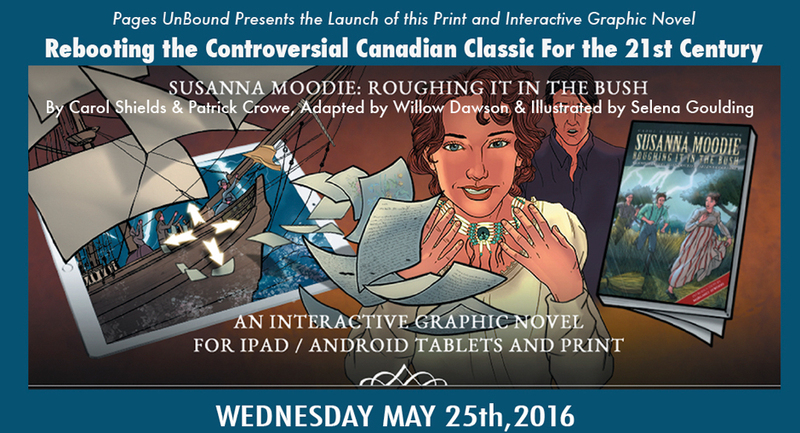 Pages Unbound presents the launch of Susanna Moodie: Roughing It in the Bush, Wednesday, May 24th at 8 pm at the Gladstone Hotel, 1214 Queen Street West, Toronto. Print meets digital in this interactive evening with the creators of the graphic novel and interactive book. Inspired by British-born Susanna Strickland Moodie, who settled in Canada with her husband and first of six children, Susanna Moodie: Roughing It in the Bush is both a graphic novel and an interactive book as interpreted by Pulitzer-Prize winning author Carol Shields and realized by her co-author, Emmy Award-winning producer Patrick Crowe. A Romantic writer in Regency era London, Susanna Moodie’s life was turned upside down when she and her husband embarked for the backwoods of Canada in 1832. Utterly unprepared for the gruelling hardships of pioneer life, the Moodies soon found themselves starving in a hostile wilderness. In order to survive, Susanna cranked out autobiographical accounts of her family’s misfortunes leading to the publication of Roughing It in the Bush, a bitter condemnation of pioneer life. Written as a warning to other would-be immigrants, the book exposed lives ruined by the lies of greedy land merchants, transforming its author into a controversial figure praised in Britain and the United States but condemned as a traitor in Canada. Susanna Moodie: Roughing It in the Bush is a beautifully-realized story for anyone interested in Canadian history and culture: for cynics, for students, for immigrants, for fans of graphic novels and of Jane Austen, and for readers just discovering the contrarian Mrs. Moodie and the delightful, insightful Carol Shields. Now available in print from Second Story Press and as an interactive book for iOS and Android. Adapted by Willow Dawson with illustrations by Selena Goulding and a forward by Margaret Atwood.